Flight Control was one of the most popular games on the App Store this past year, selling over 2 million copies. 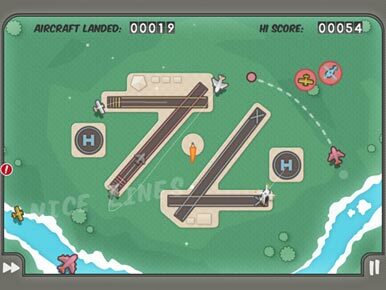 Combining addictive finger-drawing gameplay with a clever concept (playing as an air traffic controller in a busy airport) Flight Control launched an entire new genre of puzzle gaming and spawned many imitators. On Friday, Firemint announced that Flight Control HD ($5) for the iPad is available for download on the App Store. The exceptionally successful air traffic control iPhone game not only gets a full graphical upgrade, but new modes, new airfields, and a new 3D view that will allow you to see aircraft floating above the iPad with the aid of 3D glasses. 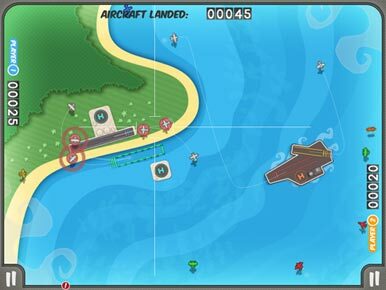 In addition to a compelling single player campaign, players can enjoy a split-screen versus mode that tasks you with “sending your planes to capture aircraft from the opponent.” There’s also a cooperative multiplayer mode on a single iPad; you’ll share landing duties on any of the new three HD airfields. Firemint also knows how to build an online multiplayer mode. Flight Control’s cross platform multiplayer will allow you to play with your friends on an iPad, iPhone, or iPod Touch through a Wi-Fi or Bluetooth connection. There are now eight airfields, including the original, beach, carrier, and outback levels plus the three new HD airfields and a new snow airfield with variable wind direction. But perhaps the most intriguing aspect of Flight Control HD is the 3D view. The red and cyan glasses (which are not included) will allow players to see their aircraft fly above the iPad device itself. Whether or not it’s a cute gimmick or the wave of the future in iPad gaming we’ll have to see.